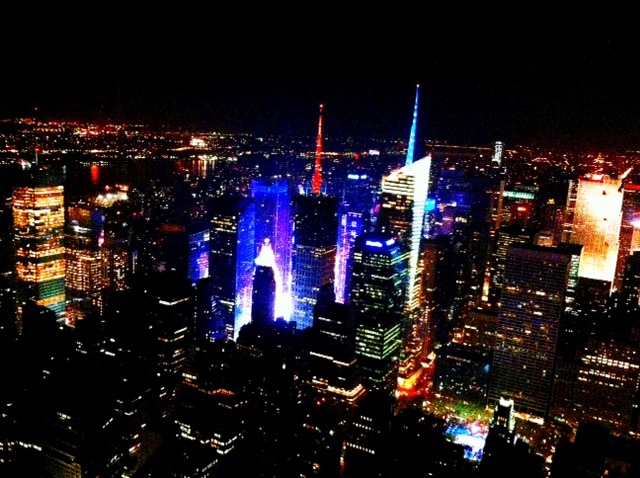 This photo of ‘night’ was taken from the observatory deck on the 86th floor of the Empire State Building. I had never been to the deck in the evening, so this was something new for both our French exchange student and my family. I kept expecting to see Tom Hanks and Meg Ryan, but no such luck. However, we did have gorgeous clear skies with spectacular views of the island. This shot is looking out towards the west side of Manhattan, Times Square and Bryant Park. It was a much different perspective for us, having walked those areas earlier in the day. And it was such a peaceful way to end our Thanksgiving Day. Pressed for time these past few days, I again snapped and did an edit on the go. I sharpened in Snapseed and applied the colordodge filter in camera+. “You don’t take a photograph. You ask, quietly, to borrow it.” ~ Author Unknown. The truth is, I’m not happy about this photograph. Even writing isn’t flowing like it usually does, and editing with my remote hookup has been a nightmare. I guess a great picture just isn’t going to happen for me today. So I’ve taken the best of a poor few, and posted it here reluctantly. 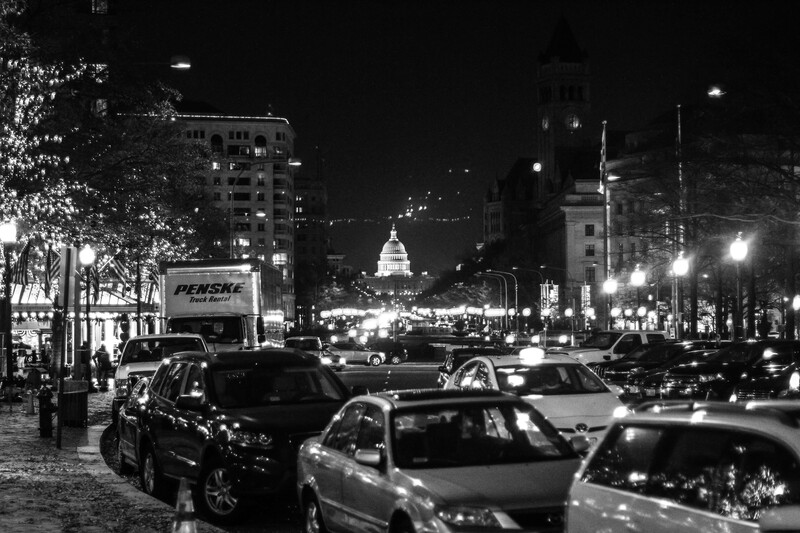 It was taken at about 8 o’clock at night looking down Pennsylvania Avenue with the Capitol building as the focus. The very positive thing though is that I have loved our stay in Washington DC, it’s been a great family break with so many interesting and wonderful things to see. ISO 1600, shutter speed 1/100, f/1.4. Letting in light was ok with all the street lighting, but the downside was the increase in ‘noise’ due to the higher ISO, and also the haze above the city, contributing factors in why I converted to black and white. LIghtroom work was minimal due to the problems I had with the remote hookup. I had some potentially great shots of the kids in front of the White House at night but they just weren’t right, and I couldn’t do what I wanted to them. I was not happy! So I just increased the clarity and sharpening on the image that I could work with. No Tom or Meg? What gorgeous view of NYC!